La Bastide d'Esparon is a haven full of breathtaking views in an authentic medieval hamlet perched and tucked on an eagle's nest. A sunny and spacious XVVIIth century Cevenol stone house, very peaceful --therapeutically so--. Two great houses reunited for gentle family living, linked by a terrace outside, doors inside: ideal for one family of 4 to 5 or a group of 6 to 14 friends. La Bastide has a magic to it, in a very well restored and refined atmosphere, with high ceilings, white walls, and a great feeling of luminousness. Some say it was the location of the old Merovingian castle. The house still has old sinks, carved stones, vaulted ceilings, which attest to its past history. You are in the South of France and you feel you are on the top of the world, between mountain and sky. 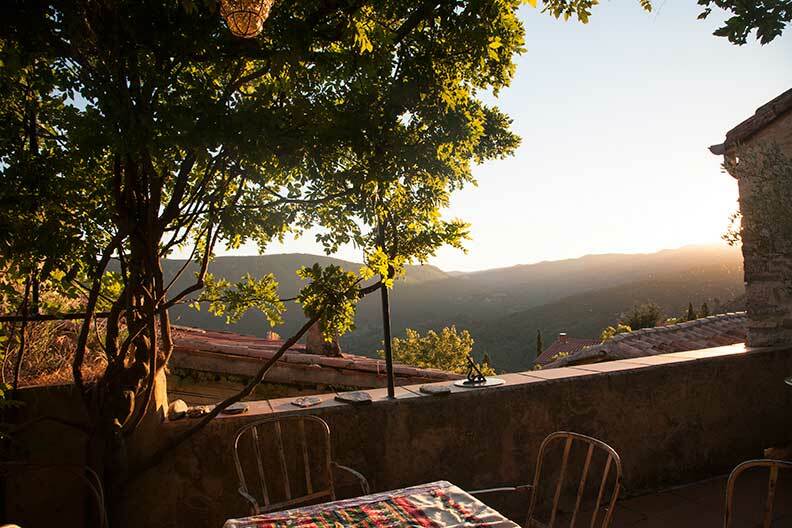 You are living indoor and outdoor with constant views from the windows and terraces on the untouched countryside of Les Cevennes Meridionales with its rolling mountains, high plateau and big sky. With its 3 terraces and big windows, you feel that you are living in nature. A well-decorated place, much loved by the creative, colour-conscious family who have owned it for 50 years. 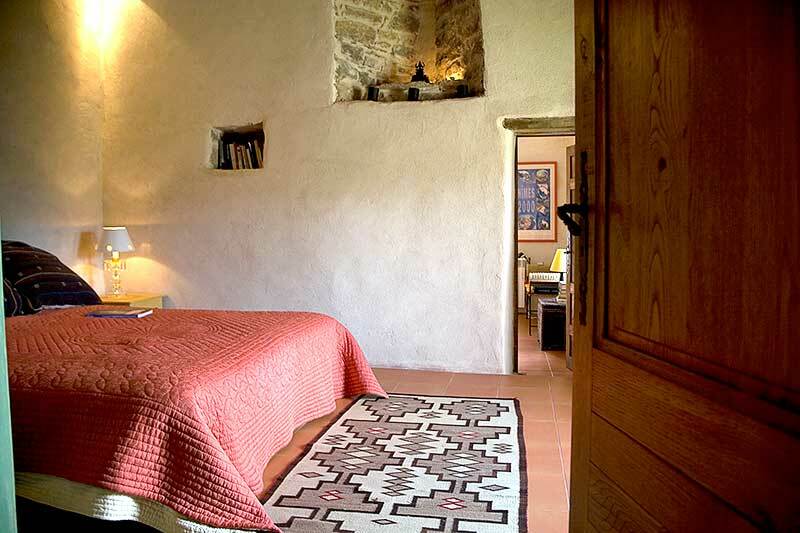 Everywhere are lovely kilim rugs and pieces brought back from the owners' travels and finds in the Provence region– fine old wooden chests, antique wardrobes, contemporary art and books. A most atmospheric, esthetic retreat from the busy world cooled by mountain breezes in the blistering summer, with superb walks, rivers for swimming or canoeing down in the valley, unusual excursions galore - and just 6 kilometers from all shopping. 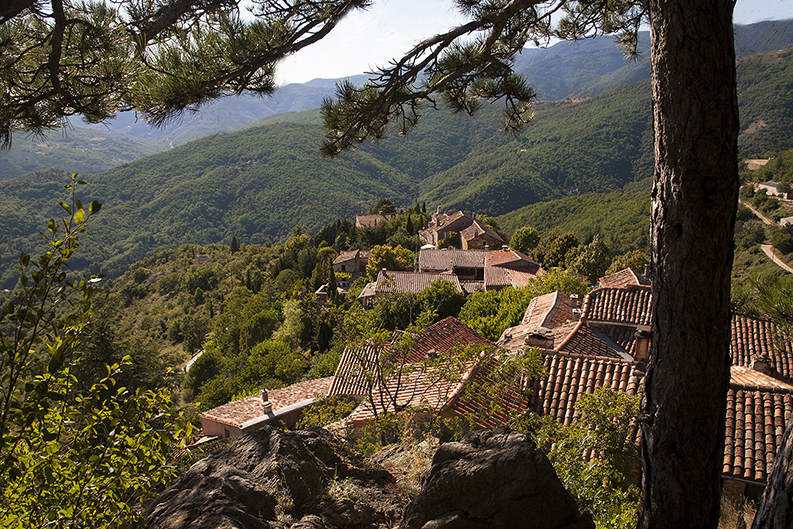 Located in The Parc National des Cevennes, you can walk in the hamlet without cars, go and see the XI century roman chapel and into a pine forest on the top of the eagle's nest, or head off for one of the many GR Trails which start from the house. The hamlet of Esparon is an intact medieval village in a very picturesque ensemble of 25 houses with a chapel and fountain, and remains of ramparts and towers. It is located in The Parc National des Cevennes protected by the UNESCO World Heritage for its authentic natural landscapes. Perfect for nature-lovers who love to walk and hike on the great trails, go to the surrounding rivers and picnic and yet like to be in a refined home and prefer the reinvigorating rivers to a swimming pool. Situated in the Languedoc-Roussillon. 40 minutes from Montpellier and Nîmes airports, bus and train stations. From here, you can visit the area of The Languedoc, Les Cevennes, Les Causses, La Camrrgue and go to all the great summer festivals of Avignon, Arles, Sete, Aix or just take great walks and enjoy the fantastic rivers and majestic beauty of the region. For Contact and Testimonials, go to CONTACT.